Our first day of the adventure started in Ponta Negra, where we stayed at the Manary hotel, in front of the kite spot and 40 minutes from the Natal airport. The anxiety set in as we were about to start the longest kite trip of our lives. On August 21, 2018 we started the journey with constant winds and great waves along the way. Those who didn’t know the stretch still had butterflies in their stomach, but the wind that moves you also moves away the anguish and fear, we just needed to go with the flow and enjoy. 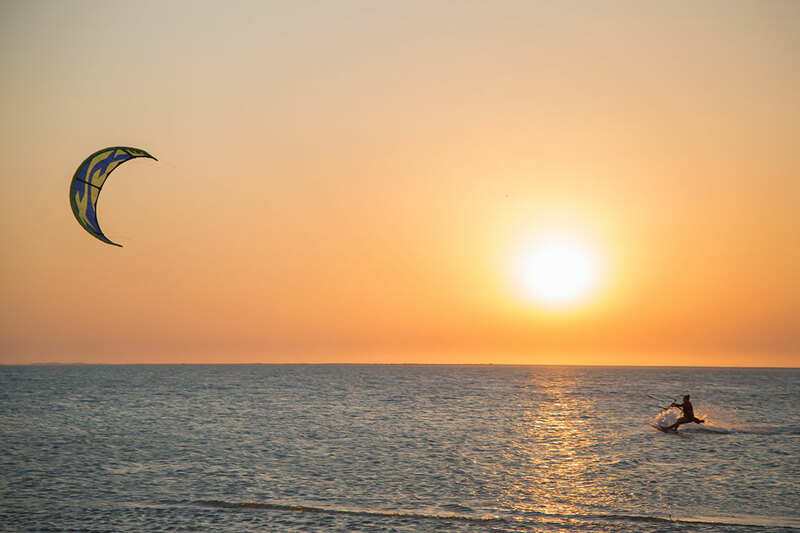 The song that accompanies us on such an unknown kite trip has lightness and freedom in the lyrics, as if one could embrace oneself by immersing into nature and connecting with the waves. The unknown route was completed in a short time and united us with some of our other friends on the beach of Genipabu, late for the adventure, but who arrived at the right time. Welcomed by hugs and full of joy, this meeting welcomed us to a beautiful walk into the unknown, full of surprises. 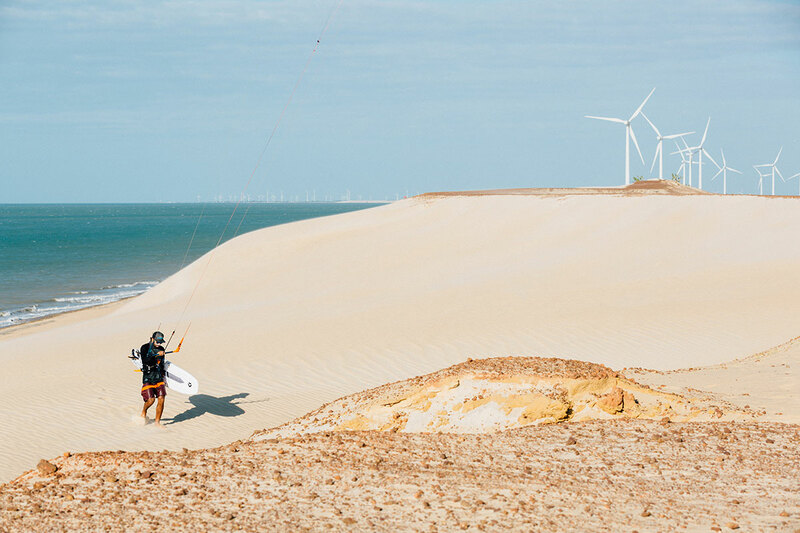 We were 6 kiters in total> Marcela Witt, Jalila Paulino, Andre Penna, Marco Dalpozzo, Sebastian Ribeiro, Jelle Van, and a few others who joined along the way. We were all guided towards the sunset, towards the next destination: the restless beach of Maracajau, where we were happily welcomed by other lovers of the sport at the Maracajáu Kite Center. We stayed in a simple home, with a great view of the sea that welcomed us to rest from the intense day of kiting. And so, it was our first night as a group. Next day, we left with good winds, and explored the coast towards São Miguel do Gostoso. The high tide did not allow us to experience, or in my case to revisit, the paradise called Parrachos— a coral barrier reef of more than 10km in which we can kite over, but we would have to kite 5km out to sea until arriving at this preserved gem, so little known even by our Brazilian people. The route was intense, because we had moments of weak wind and strong wind, on and off. We passed by the 0km highway marker, where in my case I was swept along by the strong winds, again contributing our goal of heading north. I was very happy that we had plenty of wind! Sao Miguel do Gostoso is a little explored village; some travelers have already had the pleasure of walking across these lands. Here you don’t see many buildings or a lot of people, which is probably a good thing! There we stayed in Mi Secreto and also at Mar de Estrelas— a hostel that has welcomed tourists for years with great friendliness and a wonderful dinner for our group, and like this we concluded our second day. 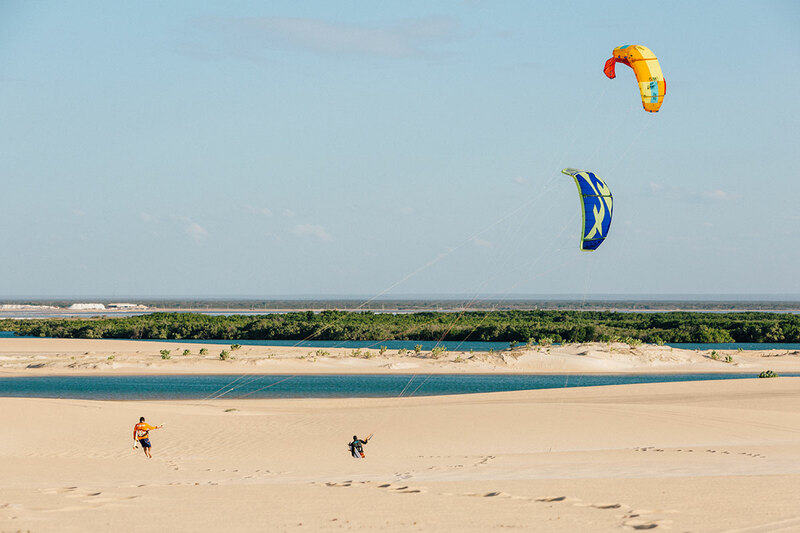 The next day we headed to Galinhos, a route that we would have to kite with a land-based wind. Some of us were worried that the wind may not be very friendly, but in the end it was a very interesting day. Here we saw incredible landscapes, beautiful beaches. Our Brazil is so beautiful and so unknown. It was an impressive piece of coast, with the sea and dunes meeting, it reminded me of our Delta but with clear waters and much beauty hidden. I’m glad that we were able to explore such a place. The hostel AMagali is situated in an amazing place, located in front of the river, with a unique beauty leaving us curious with what was to come. Next day of kiting was very fluvial. There were many meetings that day.. the river and the sea talked as we passed, where we very slowly observed each moment before arriving in another hidden paradise called Soledade. I had heard of this place before.. I had to stop, sleep, wake up, and enjoy all of that beauty. And so we did!! The next day we saw the rivers and seas talking again, but the weak wind caught us by surprise. We fell and rose many times, feeling the water hugging us and connecting with ourselves in the midst of such beauty. That’s how I felt that day. I’ve never had to do so much looping in one day— in one trip. We continue to drag along, until the wind returned. The group of old friends shared unique and special moments that would never come back, except in our memories. The places we passed on that day to Tibau were also beautiful. The huge beaches and white sand dunes will surely never be forgotten. We also had native kiters join us, who motivated us to follow along the way, giving us a little local knowledge and company for the magical kiting. On this day we were invited to sleep in the house of a local names Paulo, who had the embraced countless people together, presented us with dinner, a good night’s sleep, and an amazing breakfast that left me strong for the long day ahead. 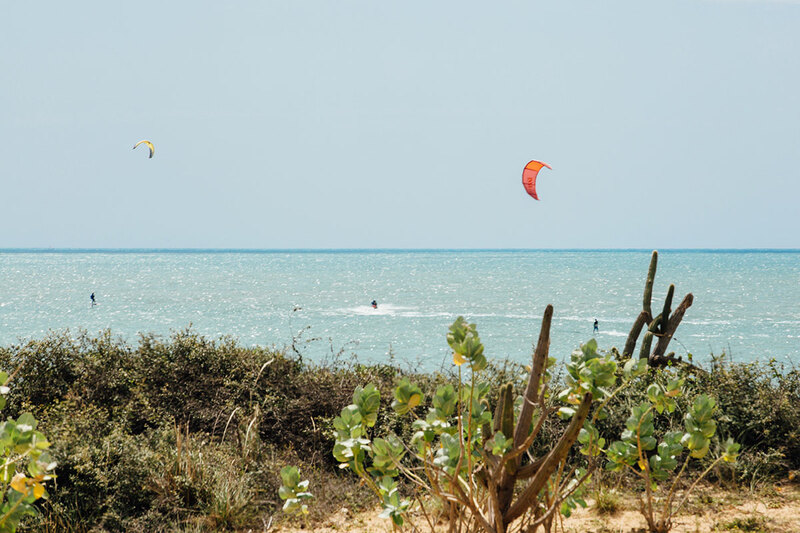 The departure of Tibau was quite difficult, especially for me, that I am accustomed to kiting in the land of the strong winds, so a size 12 kite wasn’t very much my style. 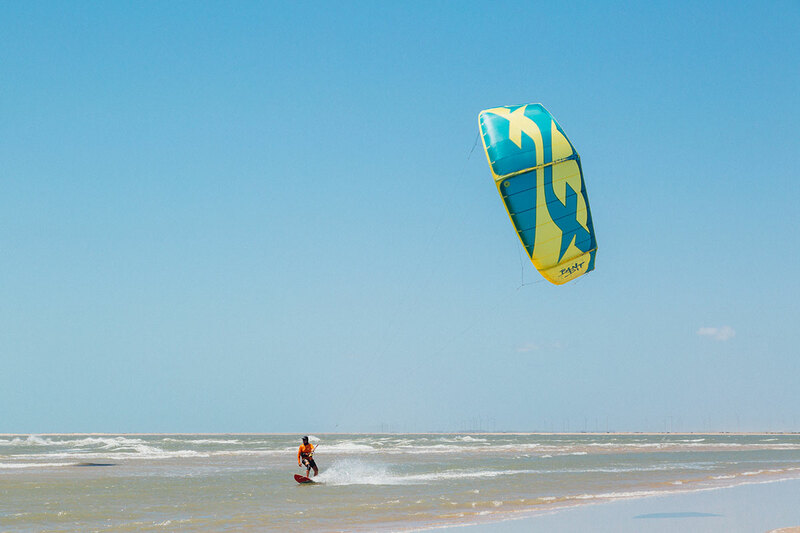 I ended up stepping out of that little part of journey and connected with other people who weren’t involved with kiting, and learned a little more about the Brazilian culture. This was a very special day because I needed people that were unconnected to meet other types of people who are connected, without no money and no phone number, while not being sure if my friends were going to be able to reach Fortim, which was the destination of the day. On this day I met 2 nice people who sympathized with my story, and decided to continue with me to meet with the smaller kites that we saw well ahead. But another encounter between river and sea caused me to change course for yet another discovery- for me – that other humans that I meet along my way, are willing to help me. After 35km rounds they left me in a friendly hotel of a cool couple who offered me a full plate of fruits and a cashew juice. After, I left to find another soul that could open their hand on their Sunday with their family, to help me advance in my journey. We went by motorcycle, with a board, a harness, and kite, headed north. 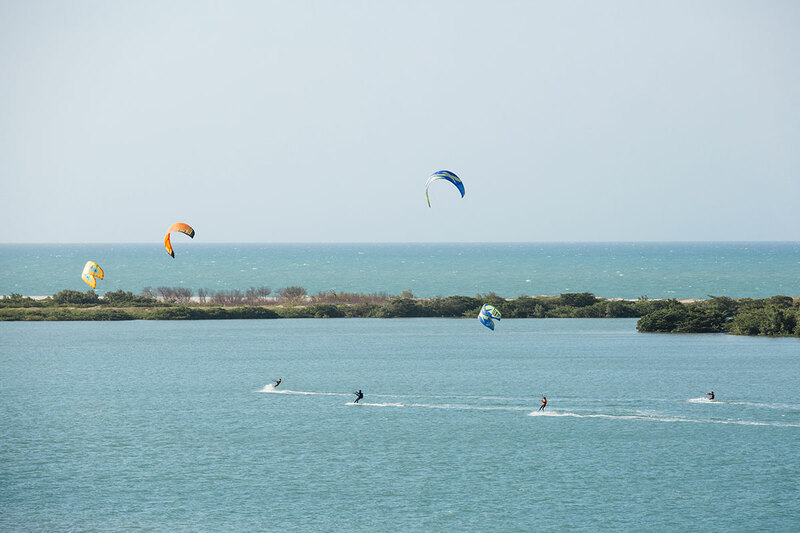 We took roads, beaches, and saw unusual landscapes… we talked with the fishermen and they always had the same speech: “a group passed by with some colorful kites about half an hour ago”… we were confident we could find them. But because of the high tide, we were unable to continue along the beach, so we continued along the unexplored red dirt roads, smiling at the natives who were there. We went until we crossed a group of fishermen who said they had talked to the kiters and that they had the objective of going from Canoa Quebrada to Fortim. So I was offered a ride by car, and honestly I preferred it, since it had been traveling 30km on the bike… I had to say goodbye to my friend. I was now in the company of the simple gentleman who did not speak much. When I started to tell him what we were doing, going to Atins, his eyes filled with joy, he said that in the fisherman’s time 20 years ago when he went to Travosa, Atins only had few people and that he loved Maranhão, where he almost moved to. When he sailed by boat, fishing for months on these lands that until today, and he missed it. It was very nice, because we both stories to share. We talked until we finally met the group in a broken canoe bound for Fortim. There we were at home, we arrived without warning and we were welcomed to the Vila Selvagem, with a nice dinner and great sleep that renewed for the next day, bound for Aquiraz. Here we enjoyed some beautiful kiting with Serena and her boyfriend. There were landscapes of cliffs that adorned our route, a striking encounter with nature, true art of God, which he carefully designed to impress the adventurers who passed by. I felt privileged to be able to enjoy these beautiful moments. We arrived in Aquiraz at the Carmel hotel and had a good stay. Next day we would have the energy of the big city, already knowing that day would arrive and that it would be a long journey. I did not go, but I took care of the brave friends that made their way to the destination of Taiba. We entered our environment, which we know just as well as walking. They were all vibrant and excited to go. The ninth day of our trip took us to Icaraizinho, it was a long day with several happenings, which put us to the test and more focused on our goal. We arrived at sunset, with a warm welcome from Vila Mango. It’s always a pleasure to be with those who love us. Rancho do Peixe, who welcomes those from all walks and different destinations. It was a light kiting day, well-known, and long, but with the ease of mind that we would be arriving at our favorite bungalow. 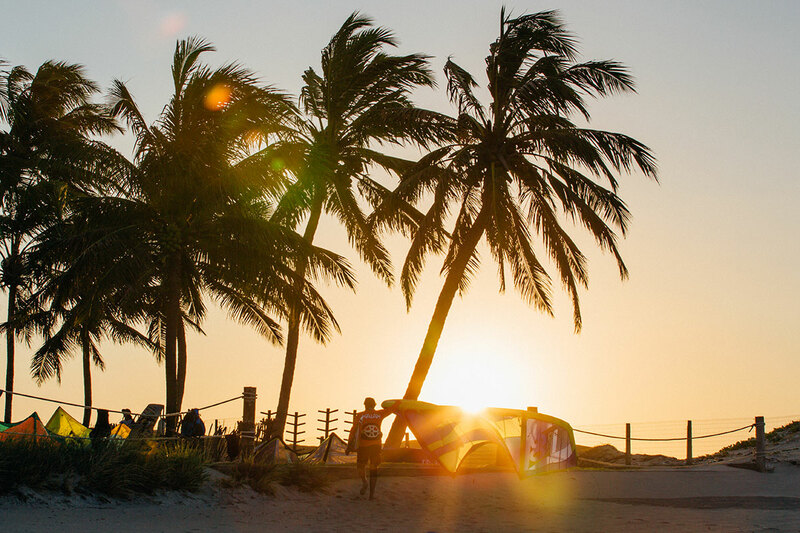 The tenth day was from Prea to Barra Grande> a long journey of 100km by sea, perfect for those who need to face their problems or even find solutions, a path already known by the kiters, who only moved towards another sunset at BGK hotel. By the next morning we were all anxious about the passage of the portal, where we would have to cross the river Parnaíba. This time we passed through it and we kited to Caboclo hotel that is on the river’s edge. 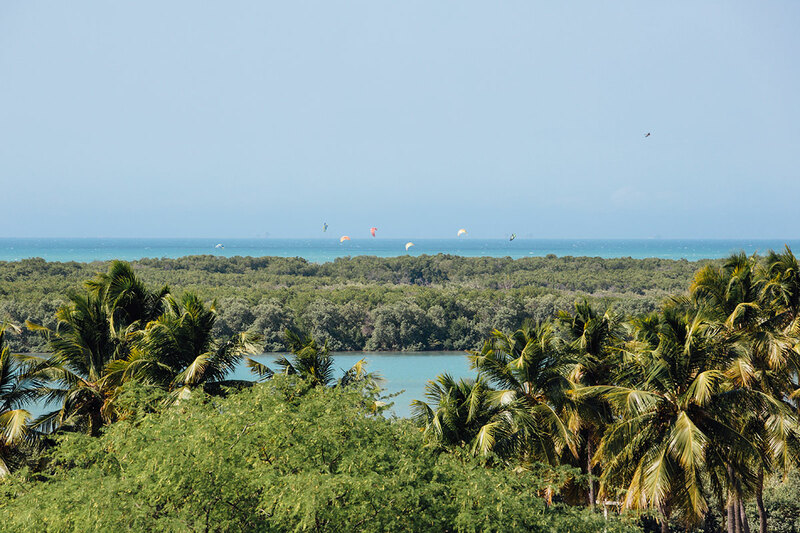 We carried our energies on this day of kiting, after all with such exuberant beauty our kiting seems to be lighter, moving with a good feeling while we passed the greenery of the mangroves, so rich in nature, a place also little known by our Brazilian people. We woke up with a beautiful morning canoe ride, the igarapés have the divine purity. I was happy to enjoy all of this with other people. This day was very special, we went to Tutoia, passing through the waves of the Poldros and while entered our favorite river of “feijão bravo”. Then we enjoyed the waves of Melancieira island. The best kiting day of all, in my opinion. Phew, we had arrived in Tutoia, with tired smiles, and we still had one more day of kiting. 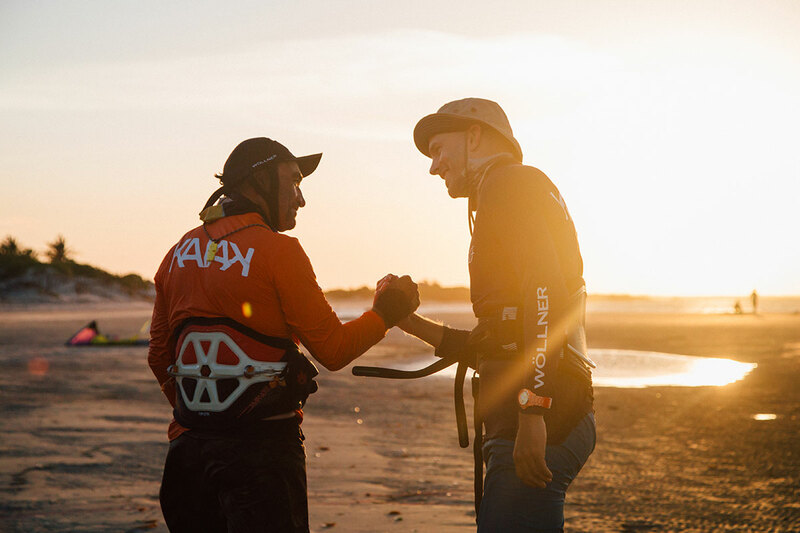 It would be very special to complete this goal as a group, where everyone has helped each other and shared moments of this journey by the sea, with a lot of kite looping and connecting back with nature. We ran against time, we hurried, we got nervous, we fell, we got up, and in the end we fulfilled the great goal of the UltraMan. Translation by Hammond Sale Jr.